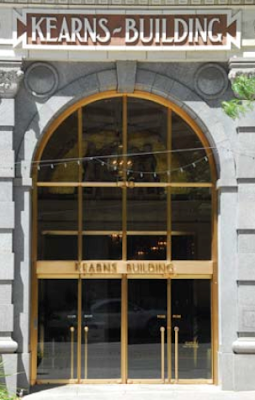 East entrance to the Kearns Building. Kearns was not reelected, failing to fi nd the political support he needed within the state. As a parting shot in 1905, he launched a bitter attack from the fl oor of the Senate against the LDS Church. Kearns had purchased the Salt Lake Tribune newspaper with his partner David Keith in 1901, and bitter anti-Mormon rhetoric filled the pages of the paper from 1905 until 1911, when the tone significantly mellowed. National magazines picked up on the Tribune charges and published scandalous articles about the Church during this same period. Publications in Britain also got in on the fray, making the first decade of the 1900's a difficult one for Church members because of their reputation in the eye of the general public. The Kearns Building sits on the west side of Main Street, south of Temple Square. 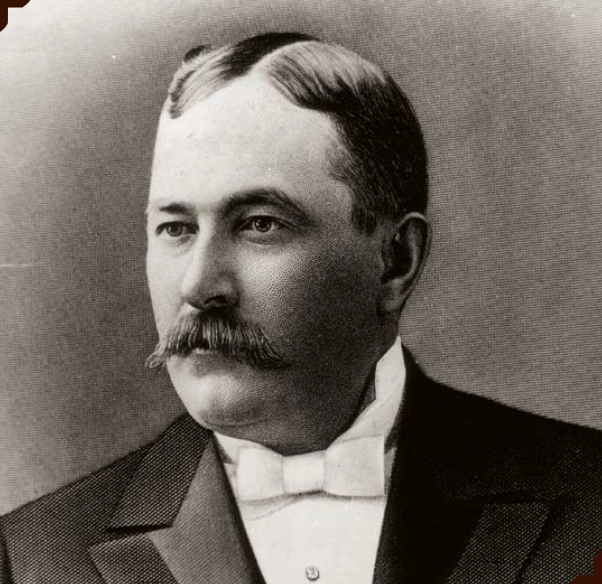 Thomas Kearns became a wealthy mining executive and then a senator from Utah. 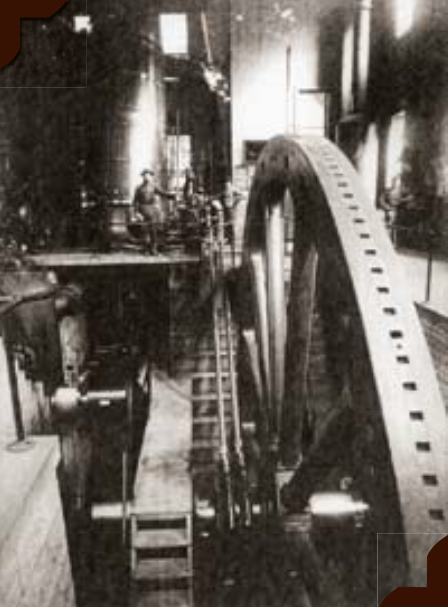 The Silver King Mines plant used a gigantic flywheel, cables, and belts to haul ore out of the mine. and is distributed by B.U.M.P. LTD.
where the Joseph Smith Memorial Building stands today. 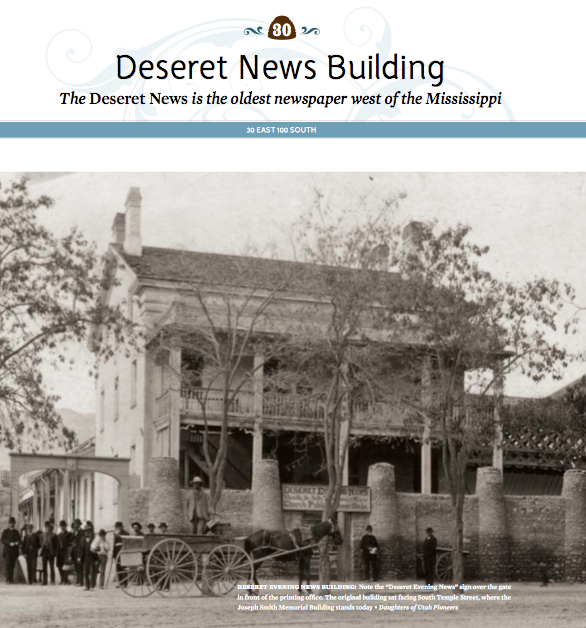 Note the “Deseret Evening News” sign over the gate in front of the printing office. 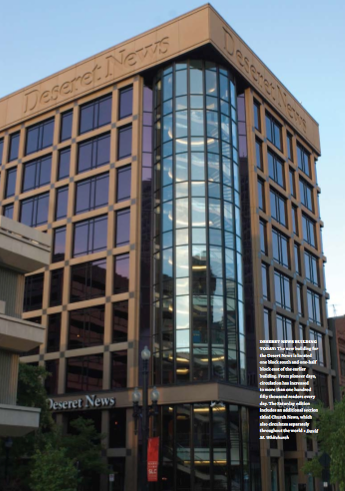 The Deseret News is owned by the Church of Jesus Christ of Latter-day Saints. The Church first became involved in the newspaper business in June 1832, when W. W. Phelps published the Evening and Morning Star in Independence, Missouri. Even after anti-Mormon mobs broke into the Phelps’s home and destroyed the press in 1833, the Church continued to publish various newspapers in Kirtland, Ohio, and Nauvoo, Illinois. 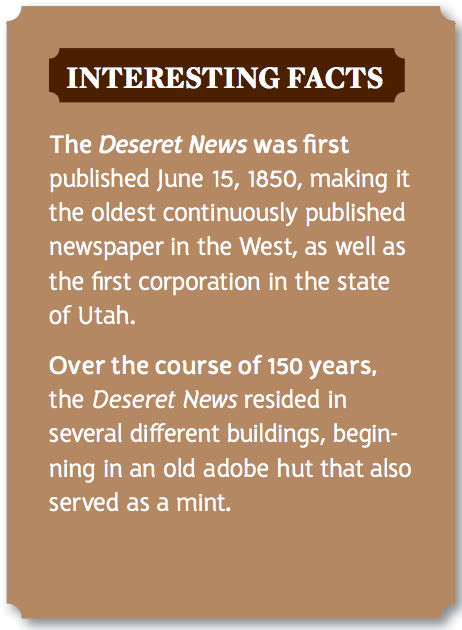 Three years after the Saints arrived in the Salt Lake Valley, the first edition of the Deseret News came off the press on June 15, 1850. Nearly 150 years later, on May 28, 1997, the new Deseret News Building was dedicated in Salt Lake City. This nine-story, circular building is constructed to represent a newspaper. The logo found at the top of the building is identical to the masthead in the daily newspaper, and the windows are mathematically designed to the exact measurements of the columns in the daily newspaper. In addition to the unique exterior, the interior contains the latest technology. Inspiration for the Deseret News came in 1846 as the Mormon pioneers were camped on the west bank of the Missouri River at Winter Quarters. As Brigham Young was contemplating the Saints’ future in the West, he recognized the importance of maintaining contact with the outside world. In the spring of 1847, President Young requested that William W. Phelps purchase a press and then transport it to the Mormon settlement in the West. Painting of Willard Richards inside the Pioneer Memorial Museum. Later that summer, Phelps borrowed sixty-one dollars from Alexander Badlam to purchase a Ramage press in Boston. The new building for the Desert News is located one block south and one-half block east of the earlier building. From pioneer days, circulation has increased to more than one hundred ﬁfty thousand readers every day. which also circulates separately throughout the world. Howard Egan, a future Pony Express agent, was designated to transport the press to the Salt Lake Valley in an oxen-pulled wagon. He arrived in August of 1849. Shortly thereafter, Brigham Young appointed Willard Richards as the first editor of the Deseret News. Then in June 1850, the first issue appeared, containing news that was both momentous and trivial. 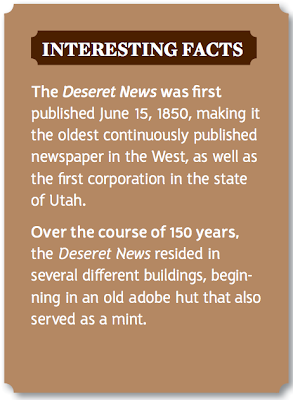 From 1854 to 1856 the Deseret News was published in the Tithing Office. Built and maintained by the International Society, Daughters of Utah Pioneers (founded in 1901), this structure was built to preserve the history, artifacts, and landmarks of Utah pioneer ancestors. There are hundreds of examples of beds, cribs, and chairs in the museum. Multiple floors house the innumerable donated and collected artifacts. The objects belonged to memorable Church figures as well as lesser known pioneers of the past. 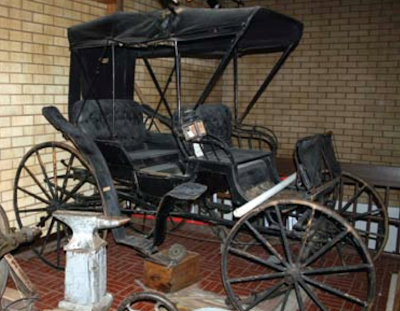 This wagon was brought to Utah by Johnston’s Army in the late 1850s. then later restored when placed in the museum. One could spend from a half an hour (for a quick walk-through) to a full day or two (for an in-depth historical study) here. gives an idea of the comforts of home following the earliest pioneer times. 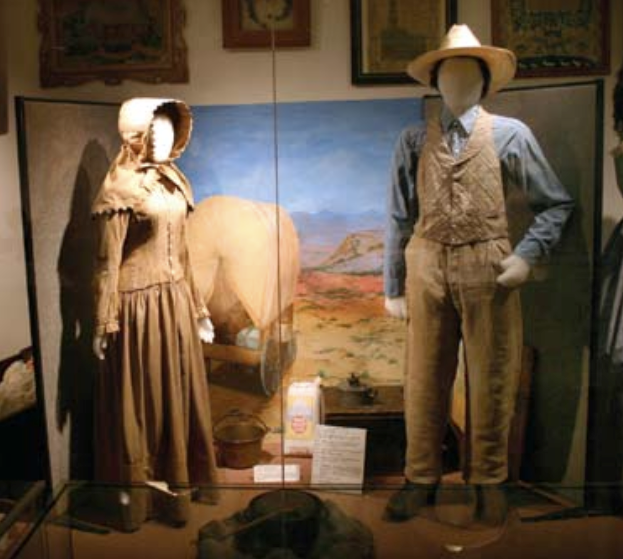 The Museum has been recognized as one of the world’s largest collections of nineteenth century pioneer artifacts. 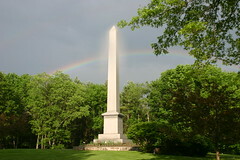 It contains Mormon memorabilia, period furniture, and photographs. The Pioneer Memorial Museum displays clothing typical of early days in Salt Lake City. Carriages like this were common conveyances in Salt Lake City until the coming of the automobile. 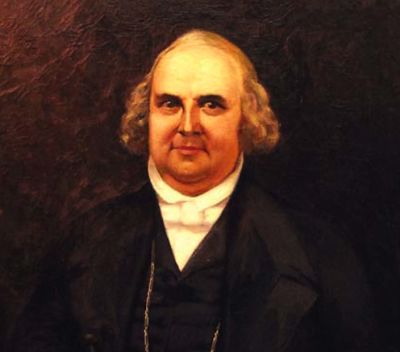 Willard Richards used to ward off guns at the Carthage Jail doorway when Joseph and Hyrum Smith were killed. © by Intellectual Reserve Inc.
Construction commenced on October 17, 1947, one hundred years after the arrival of the first pioneers. 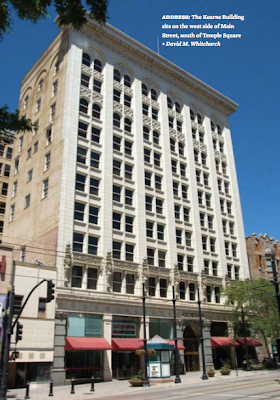 that was built several blocks to the southeast at 100 South State Street in 1861–62. "I have been sharing this information with friends around the world and the response is outstanding. These tours contain information that we could never access on our own and can be shared and treasured forever." BYU Friends of Religious Ed. featuring BYU Religious Educators teaching about sites significant to The Church of Jesus Christ of Latter-day Saints. "A great source for weekly Mormon Church History Videos"
"One of the finest projects ever to come out of Religious Education at Brigham Young University." "This is really cool. Thanks. I just hope I don't spend every day on virtual vacation." "These documentaries bring these church history sites to you. I have enjoyed viewing them. They are very well done." "It was very spiritually and historically based. I enjoyed reading/hearing about the past and being able to see the differences and the inspiration the prophets had for the future." "Wow, what a great program! My kids loved it. Each piece was packed with information and it kept their attention." "This is a GREAT idea. Thanks..."
"I loved the incredible knowledge the tour guides had as well as the music set to each historical site." "Absolutely fabulous! The historical background information about each place really made it come alive. "The Virtual Tours program re-states, for all to hear, the testimony of Jesus Christ that the early pioneers had and what they went through to bring the revelations of scriptures to light."